game in an overtime loss to the Huskies tonight. An amazing effort by rookie goaltender Justin Collier wasn't enough for the Tommies tonight, as the SMU Huskies defeated STU 3 to 2 in overtime. 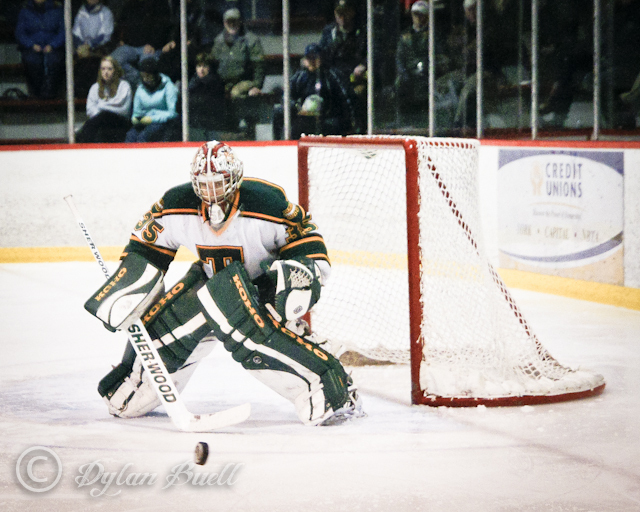 Collier faced 43 shots and made several large saves to keep the game close. The Tommies were first on the board at 8:07 of the opening period when Sebastien Bernier made a nice pass off the boards that sprung a waiting Yuri Cheremetiev on a clearcut breakaway. Yuri made no mistake with a beautiful move to put STU up 1 - 0. The Huskies pressed hard late in the period and out shot STU 8 to 4 in first. Saint Mary's came out gunning in the second but STU capitalized on a powerplay at 6:06 when Randy Cameron (Scott, Cheremetiev) converted to increase the lead to 2 - 0. Collier closed the door for the rest of the period with SMU out shooting STU 15 - 6. St. Thomas had a glorious chance early in the third to go up by three goals but the puck wouldn't settle down enough for Bryan Main to make good on the open net chance. Saint Mary's finally broke the goose egg at 12:30 on the PP and tied the game 1:40 later. Both goals were perfect shots past Collier, who had no chance on either. The game would head to overtime tied at 2's and shots in SMU's favour 38 - 16. The overtime was a back and forth affair with even play for both teams. The Huskies would capitalize on a point shot that was deflected past Collier for the winner at 6:03. Saint Mary's named the STU goalie first star of the game over SMU's Chris MacKinnon, who scored the overtime goal and had an assist. Pretty classy IMO. Some other teams could take notes. STU will have little time to lick their wounds as they head to Antigonish and tangle with the sixth place X-Men tomorrow night at 7 PM.